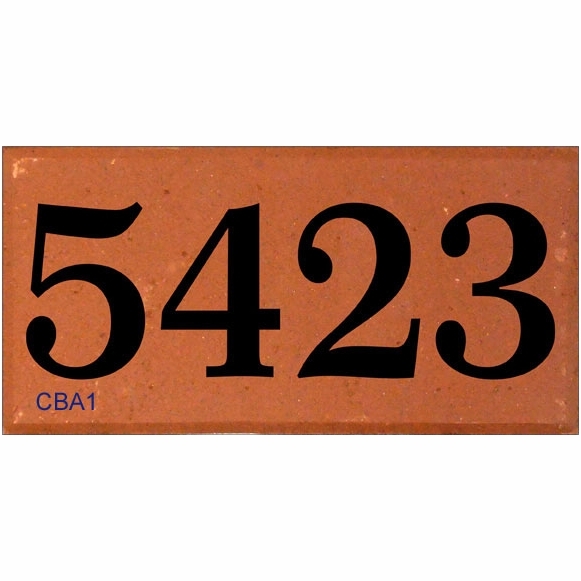 House Number Brick - - individual paver brick personalized with your house address number. This novel address sign can be utilized in various scenarios. Fast turnaround; ships in 1-2 days. Place brick in the lawn next to your sidewalk. Insert brick into the masonry next to your front door. Or insert into a brick column at the foot of the driveway. Our half-thickness street paver bricks are a dark red hue. NOTE: slight variation in surface finish and color are normal on bricks. Laser engraving produces a permanent black glass surface as a result of the laser's actions on inorganic earth element materials in the brick. The "green technology" process uses no paints, plastics, or solvents. Normal dirt is easily washed away leaving a crisp clear mark. This engraved brick contains one line of personalization holding up to four (4) 3" numbers. Dimensions: 4"W x 8"L x 1.5" thick.